In July of 1996 4,000 people gathered in camps constructed by the Mexican rebel army known as the EZLN (or Zapatistas) in the state of Chiapas in the mountains and jungle of the Lacandon Jungle. We had been invited there some months previously and many of us had previously attended continental and national gatherings. We came from some 43 countries to discuss just what was wrong with modern capitalism and what sort of society we wanted. All too aware of the mistakes of the past we were also there to discuss why previous anti-capitalist movements had failed and how a new movement could exist that would avoid these mistakes. Below are some of the reports, statements and declarations in English of those that attended this gathering. The First Declaration of Reality for humanity and against neoliberalism issued by the EZLN first called Humanity to an intercontinental meeting to be held against neoliberalism. Report from Peter Brown on the First Intercontinental Gathering For Humanity and Against Neoliberalism with a lot of quotes from the communiques. A report from a member of the report from a member of the Canadian delegation . 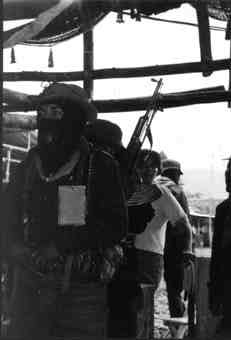 This first series of declarations were issued by the EZLN as invites to the conferences and background information about them. Invite to the the Intercontinental Encounter for Humanity and against Neoliberalism in Mexico, July 27 1996. This invite was updated and elaborated for the Berlin encounter. The conference ended with a series of report backs from the different tables (which have yet to appear in English) and a Zapatista declaration that summed up much of the discussion. 'The Second declaration of Reality for humanity and against neoliberalism' issued by the EZLN at the end of the encounter in La Realidad.